Jack Black returns to voice Po. That lovable panda is back and in a big way! The first film, “Kung Fu Panda” was nominated for Best Animated Motion Picture during the 2009 Academy Award® season and I predict the sequel will be nominated as well. It’s rare that a sequel can be as good as the first or in this case slightly better. DreamWorks Animation studio, who brought us the outstanding film “How to Train Your Dragon,” gets it. They get that children deserve a quality film, one that not only entertains but also takes the opportunity to teach a slight lesson on the side. The message in the film is loud and clear, ‘what you choose to be, is the only thing that matters’. The film can be viewed in 3D or 2D, I prefer the 2D as I like bright colors and the 3D lens dulls them. Anyway, the film has excellent animation, an outstanding score, comical clever moments and creative story telling. China’s beautiful landscapes are transposed into breath-taking backdrops for our hero Po the panda, voiced by (Jack Black). Basically you don’t need to see the first one, as much is explained from the beginning of this tale. Jennifer Yuh Nelson directs, as she also worked on the first film. Po’s dad is a goose, and while that is never clear in “Kung Fu Panda”, explanations are offered in the sequel. The original gang is back, Tigress (Angelina Jolie), Mantis (Seth Rogen), Crane (David Cross), Monkey (Jackie Chan), Viper (Lucy Lui). Together they offer a tight knit group that works well together against all evil. And evil that appears as Lord Shen (Gary Oldman) who is not too frightening to look at; by all appearances he’s a rare but normal looking peacock wearing white and red feathers. Although his bad side is revealed when your eyes adjust to view his feet, they are menacing steel claws. He also has a few magic powers – when one stares at an emblem on his feathers for too long, you might grow weak. 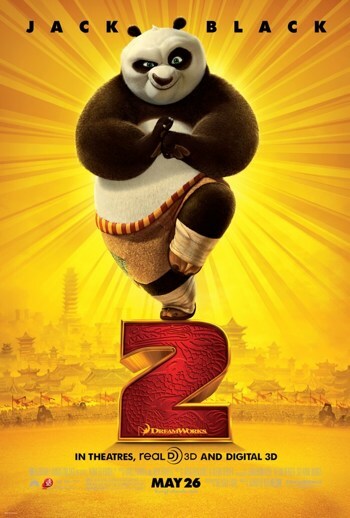 Shifu (Dustin Hoffman) is the cool, calm Kung Fu master who teaches Po his life lessons. Other characters have been added but most are part of Lord Shen’s evil pack. Po, an oversized panda’s character, is perfect for fat jokes and those run aplenty here. Po’s line as he charges into Lord Shen’s empire, “Ah, my old enemy, stairs”, warranted lots of giggles from the crowd. The scenes with Po’s father Mr. Ping (James Hung) are very comical as well. The wise Kung Fu Master, Shifu has a final lesson to teach Po and that would be finding inner peace. A difficult task, as Po is not really thrilled about meditating in a cave for 50 years without food or water, the way Shifu found his. The journey to self-actualization takes Po back to his father and back to his childhood. At times this back-story may be a little confusing for kids but becomes clear later in the film. The battles scenes are not too scary and neither are the sound effects. Perfect for little kids as comedy is woven in as well. The lovable Po steals the film and you can be sure there will be another as the final scene sets us up for a new story line. Bottom-line: Quality children’s film that hold’s your attention. Beautifully story boarded, each frame looks like an illustration from a well-written children’s book. The Hans Zimmer musical score is fantastic.